Caring for your guitar is key to its longevity in both appearance and sound. Although guitars seem fairly low maintenance, every guitar player should practice guitar maintenance in order to keep their instrument in its the best possible shape. So whether you’ve just bought a brand new guitar or would like to start taking better care of your existing one, here are 8 guitar care tips for keeping your guitar healthy. It’s obvious, changing the strings on your guitar will keep it sounding crisp and full. Strings lose their sound quality over time and the more you play your guitar, the faster the quality will deteriorate. Now, of course the frequency of which you change your strings will vary depending on much you play. Assuming you play an hour a day, you’ll probably want to change your strings once every 4-6 weeks. Check out our complete guide on choosing the best acoustic guitar strings. Oils, dust, and dirt build up on any guitar over time. That’s why it’s a good idea to clean your fretboard every time you change the strings. To do this, start by removing all of the strings and scraping the fretboard gently with a credit card. Remove the dirt and grime that comes loose and go over the fretboard again with a soft bristle toothbrush. After that, wipe down the fretboard with a soft cloth to remove any additional dirt. If your guitar has a rosewood neck you can then use a bit of lemon oil and wipe the neck down again. Alternatively, for guitars with maple necks you can wipe down the fretboard with either Dunlop 65 guitar polish or some lighter fluid. Check out this comprehensive overview to learn more about how to properly clean your guitar fretboard. As mentioned in this previous section, oils, grime, and dirt can build up fast. Wiping down your fretboard after each time you play will help reduce the build up of those unwanted elements, making the cleaning of your fretboard less of a hassle. To do this, simply take a piece of paper towel, fold it in half length-wise and wrap it under and over your strings as shown in the above image. Apply downward pressure and glide the paper towel a couple of times along the strings from the bridge to the nut of the guitar. Varying temperatures can expand and contract the wood of your guitar resulting in unpleasant outcomes. Overexposure to sunlight can also cause the finish on your guitar to fade, making it look less cosmetically appealing. Additionally, a dip in temperature can cause adverse effects to the alignment of your guitar neck, therefore sometimes requiring you to tinker with the truss rod to correct alignment. That’s why it’s important to try your best to keep your guitar somewhere with a stable room temperature. In order to keep your guitar looking in pristine condition, it’s important to regularly use a cleaning solution and polisher that will make your guitar shine and enhance the look of the wood. A good rule of thumb is to clean and polish your guitar on a bi-weekly basis. This will also help increase its resale value in the event you want to sell it down the road. The Dunlop 654 guitar polish is a great product to use for polishing your guitar’s body. Humidifiers are a great way to protect your guitar while it’s stored away in a case. 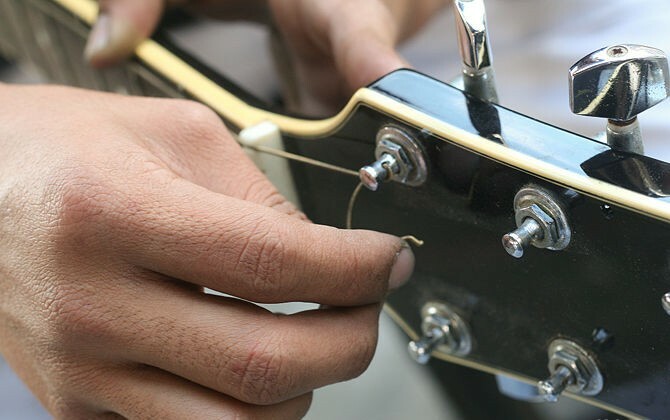 Dry periods of weather can create dips, bends, and even cracks in your guitar. Keeping the humidity in check ensures that the wood in your guitar receives the right amount of moisture and stays healthy. If you need a suggestion for a humidifier, check out the D'Addario acoustic guitar humidifier. Simply wet the sponge every 3-4 days and insert the humidifier between the strings in the soundhole every time you put it away in its case after you’re done playing. When playing your guitar be aware of what you’re wearing so that you don’t accidentally scratch or ding your guitar. Belts, rings, zipper jackets, necklaces are all examples of things that should be taken off before picking up a guitar. You might not even notice it but when you’re rocking out to your favorite song and these hard surfaces rub together you could end up with some nasty scratches on your brand new Les Paul. Bringing your guitar to a professional guitar technician is like bringing your car to a mechanic for it’s yearly inspection. A guitar technician will check the alignment of your guitar neck, adjust the action to your liking, check for any loose/lifting frets, etc… Bringing your guitar to a technician for an annual tune-up is a great investment if you plan to keep the guitar for a while and want to keep it in tip-top shape.